HOLLYWOOD—J.K. Simmons had a recurring role on the “Law & Order” franchise, co-starred in the prison drama “Oz” and won the Academy Award for Best Supporting Actor for his portrayal of an abusive band instructor in “Whiplash,” but he probably is still best known for his popular Farmers Insurance commercials. 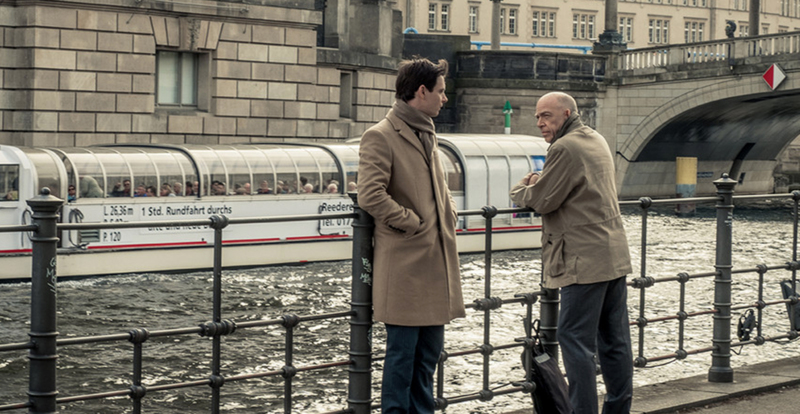 Perhaps his new sci-fi series “Counterpart” will launch him to new heights of familiarity. In the series, airing on the Starz cable network, he portrays Howard Silk, a low-level United Nations agency employee based in Berlin. He discovers the organization is hiding a secret: a way to cross into a parallel dimension. Through Howard and his near-identical ‘counterpart’ on the other side, the series spotlights themes of identity, fate and lost love. It poses the eternal question: What if our lives could have been different? Both Marks and Simmons came to the TV Critics tour to discuss their new series, which airs on Starz Sundays at 8 p.m.
Q: How complicated is the show bible, and how frequently does network executives or actors ask you questions that you don’t know the answers to? Marks: We have a show bible for this. It’s like a giant 100‑page‑long set of stereo instructions. It is the driest, most complicated, most irritating and annoying thing for anyone to read besides the writers. The fortunate thing with this show is that Starz, and MRC, our studio, really gave us an opportunity early in the process to let the show breathe in the writers’ room. Jordan (Horowitz, the show’s co-executive producer) and I were able to really find the right approach to doing this. We could go down a lot of wrong pathways. We would have more ambitious ideas of this world. (It) should have this and this world should have that and then (we’d) realize, no, that’s a terrible idea and we should turn around and get away from that as soon as possible. So, we were really able to answer a lot of the minutia questions early on in a way that I don’t think, at least in the more traditional broadcast schedule, we might have been able to do. Q: J.K., could you talk about playing opposite yourself and any particular technical things that you had to learn in order to do that? Simmons: My favorite actor to work with. (He laughs.) There were certainly technical challenges that not only I faced but then whoever else had the misfortune of being in those scenes with us faced. There were scenes involving both of me sometimes just one-on-one and sometimes with other actors. We ended up trying a variety of technical ways to make that work. Some of them were more intrusive into the process of acting that I and most actors have become accustomed to over the years. And some of them were more seamless. At the end of the day, we ended up with a method that was pretty much like most acting, just playing the scenes with another actor who would then unfortunately be erased from everything and replaced by another version of me. So, it was a process and a learning curve as indeed life itself is. Q: Do New York and L.A. exist in the parallel universe? Marks: Oh, yes. Everyone and everything exists over there. Simmons: Season 6 in Hawaii, right? Marks: Yeah, Season 6 is going to be a great; it’s all about golfing in Hawaii. Q: J.K., you’ve done so many wonderful roles in your career. Could you talk about how many different hats you wear and how you put them on and off? Simmons: Being a bald guy, hats are an important part of my wardrobe. That’s been a big part of the joy of the career that I’ve been blessed to have all along, starting when I was doing summer theater in Montana. When I was in college and we were working in rep, most us got to (be) the leading man one night, a chorus boy the next night and a character actor the next night. Having the real variety of opportunities is something I’ve always cherished and one of the things that makes me feel like I’m not doing the same thing all the time, even at my advanced age. So being able to do two different versions of the same guy in the same place at the same time puts that into a real microcosm that just makes for a really exciting and interesting day at the office. Q: Justin, you wrote the pilot script by yourself. The world is all in your head and then you invite a number of people into the writers’ room and suddenly they’re playing around in this world that you made. How does that help or hurt you? Marks: It makes it so easy. To come into a room not just with other writers but other writers of diverse genders and ethnicities and nationalities who aren’t all carbon copies of me, who are able to bring their set of experiences and their points of view to keep me in check and to keep our story in check (was great). I could sleep well every single night. No story problem was a problem, because at the end of the day, I knew that I had six other people sitting around me who were going to help me solve that problem. It’s amazing. Q: J.K., you’ve had ups and downs that is typical of the acting profession. At this stage in your career, surely you get a lot of great offers. Do you still have to pinch yourself to be in that situation, or are you just holding tight in case it goes away again? Simmons: That pinching yourself thing I do on a regular basis, and I think you’d be crazy not to. In my particular case, I never had any great ambition or it never occurred to me when I fell in love with being on stage at the Bigfork Summer Playhouse in Montana in 1970, that I would be in front of cameras and that large numbers of people would actually be watching my work. It’s an ongoing thrill. Especially in the last three years, the offers have increased exponentially. I get a lot of offers and this was one of the great offers that came my way. 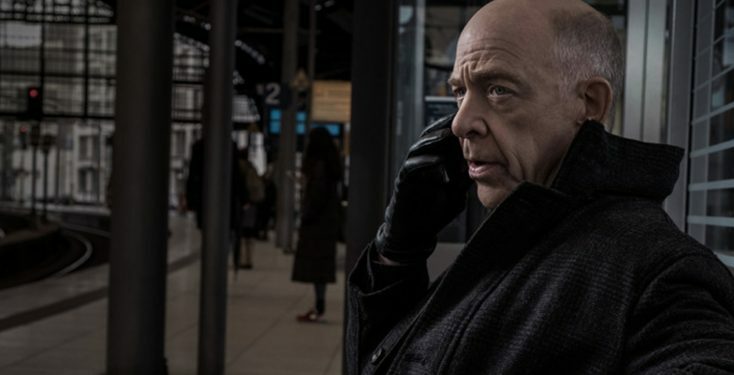 “Counterpart” airs on Starz Sundays at 8 p.m.